Stork, egret, or crane? Flying bird doorknob by R&E, originally produced in 1879, patented # 11,227 by R. Christensen in the (Aesthetic) Japanese style. Beautiful on contemporary Asian design homes, your shoreline home entry door, Victorian renovation, and more. Ours is molded directly from an original, cast for you in silicon bronze. They are sold by each. If you want a set, order two doorknobs and connecting doorknob shaft . For very thick doors, we sell an extra long 5" spindle that may be trimmed as needed. Measures 2 1/4" in diameter, and projects by 2". 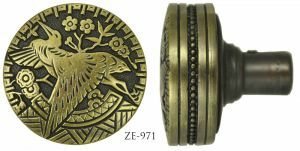 We offer an extensive selection of Victorian doorknob roses and doorknob backplates in many styles to suit this doorknob. Of course our preference would be the R.E. door plates , two of which are pictured here also! This doorknob would also work well with our Windsor pattern, a staple inhigh end Victorian homes. There are Windsordoorrplates in several sizes, or Windsordoorrplatewithturnlatch .